First, we already knew that we like Wegman’s donuts. Although we hadn’t officially tasted them yet for the Ithaca Donut Review, they’ve been our go-to donut for bringing to work to share for quite some time. Second, Laurel’s best friend from childhood was visiting Ithaca all the way from Seattle, so she was there to help. Of course, much like Laurel approximately two years ago, she doesn’t really like donuts.. so it was a little silly. She ate salad, watched us stuff our faces with deep-fried sweets, and looked cute in the flowers with her straw hat. 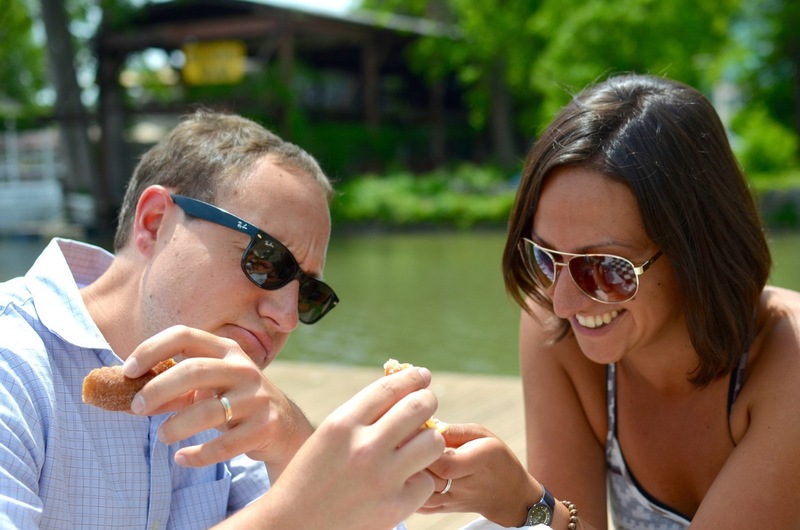 For our part, we set our prior thoughts of Wegman’s donuts aside, remained unbiased, and tasted a sample selection of the many donuts Wegman’s has to offer. You want to actually hear about these donuts? 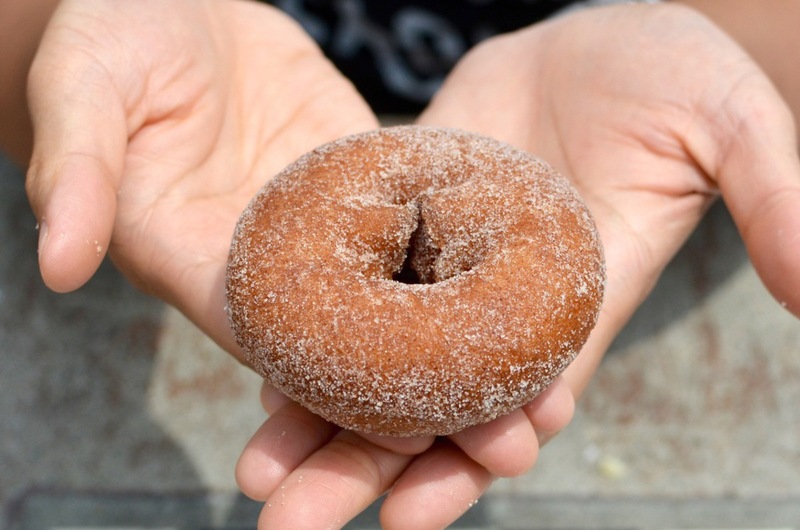 We start with the chocolate-glazed yeast donut (which we ate with much delight on National Doughnut Day). It is tender, succulent, smooth, and we just love it. The chocolate glaze is melting down the sides as Duc breaks it apart, and our mouths are gleaking all over the place. As we eat it, we both immediately use the adjectives “soft” and “fluffy” — and Duc goes so far as to rate it a 4.5/5. Laurel sticks to a 4, noting that the dough could use more flavor. Texture-wise, neither of us have any complaints. Next, we move to the chocolate cake donut. It has decent moisture, and the texture is pretty nice, but it just doesn’t taste like chocolate. And the inside dough is awkwardly separating from the outside shell. Wegman’s!!! We were gunning for you. Disappointed, Laurel chucks the rest of her donut into the inlet. Laurel gives the donut a 2.5; Duc a 3. Onward! To the sour cream donut! We are both pretty disappointed by this one. It’s much drier than the other donuts, and we suspect it might be a day old. There is a vague staleness to the flavor, as well. We aren’t impressed. 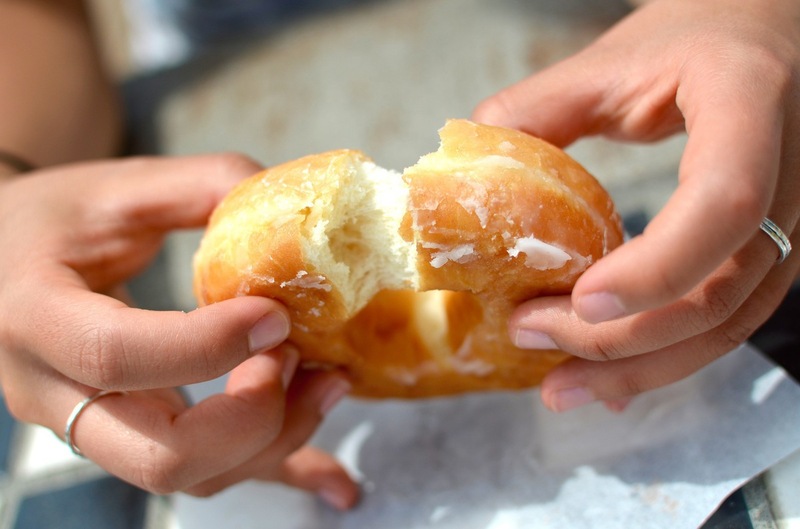 At most donut shops, extra flavor and texture gained from the sour cream in the dough tend to make this donut an easy one to make tasty. Wegman’s version doesn’t live up to its donut brothers. Dry and stale? We both give it a 2/5. Duc is pretty excited to get into this one. As he breaks it apart, he can tell it’s going to be good. Much like the chocolate-glazed version, this donut is incredibly moist, and with a subtle crustiness to the outside layer. We both love it. Laurel is still hoping for a bit more flavor (More yeastiness in the dough? More vanilla in the glaze?) and rates the donut 4.5, while Duc admits that he could eat half a dozen of them and gives it a 5. We are somewhat divided on this one. Duc likes it a lot, noting the nice cinnamon-sugar flavor and similar tastiness of the cake dough. He rates it a 4. Laurel likes that she can taste nutmeg in the dough, which theoretically could really merge with the cinnamon-sugar flavor pleasantly, but ultimately doesn’t find the taste very enjoyable. She gives it a 3. An average donut. We make Ashley try this one, and she begrudgingly gives it a taste. “I mean, it tastes like a donut,” she says. Laurel is just happy she’s in Ithaca. The babies come out to get a taste…. And Laurel and Ashley decide that instead of poisoning the duck babies with fat and sugar, they should just focus on loving each other. All told, Wegman’s scores average out to 3.5/5. Another way to look at these scores, however, is that Wegman’s yeast donuts get a 4.5 and Wegman’s cake donuts get a 3. So if you like yeast donuts, Wegman’s is doing pretty damn well for you. 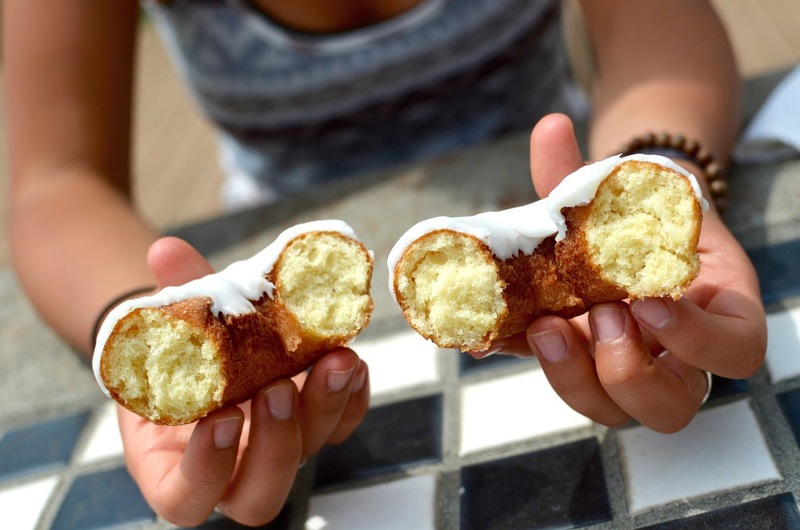 But if you like cake donuts… maybe buy a cookie instead. On our way home from a trip to Charlottesville, my wife and I stopped for lunch in West Virginia. Never wanting to miss an opportunity to find some donuts, I searched Yelp for local delicacies. Right across the border, tucked away in Hagerstown, Maryland, was a highly-regarded family establishment called Krumpe’s Do-Nuts. I had to check it out. The yeast donuts are uniquely chewy to me — in a good way. The texture is very pleasant and the insides are moist. They all have just the right amount of topping, be it glaze or cinnamon sugar, to accent the tasty interior. 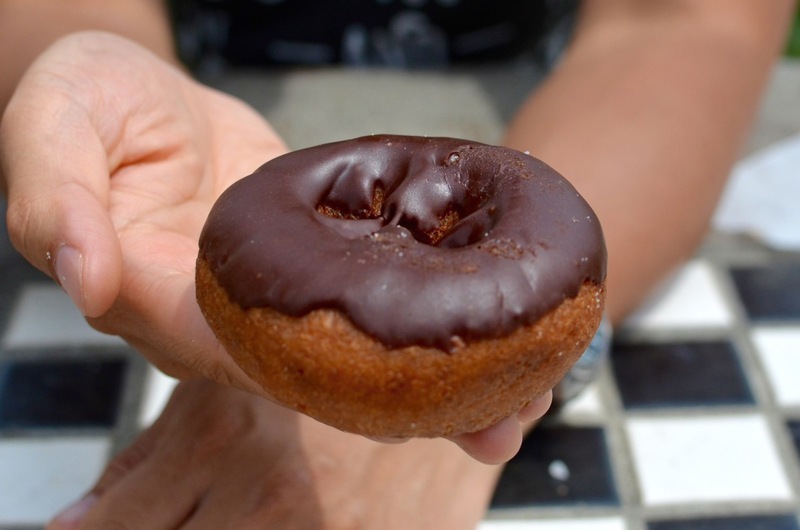 The only cake donut, which is chocolate, also provides a rare experience for me: it actually tastes like chocolate. The cake is firm, but moist, and again I enjoy the texture immensely. 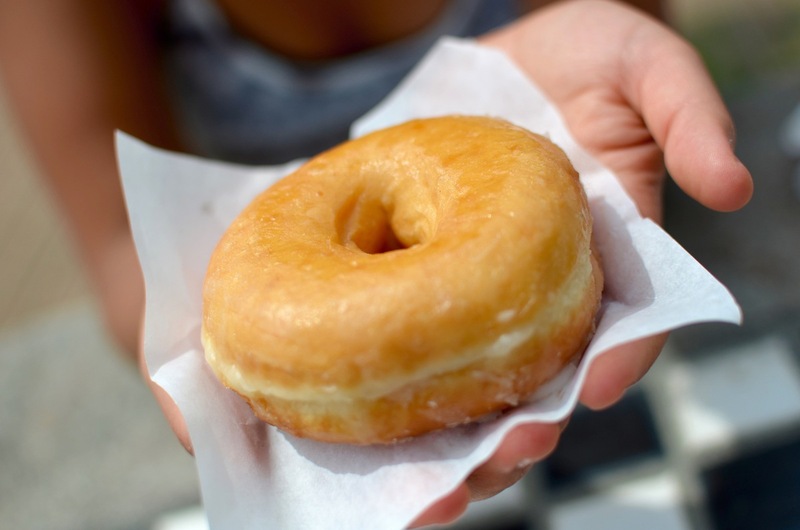 Krumpe’s 80-year history of doughnut-making certainly shows in the product’s quality. I happily concede that these are great donuts, and I can certainly imagine eating all of them, although I limit myself to a more reasonable quantity (let’s say 3, for the sake of argument), before giving Krumpe’s a perfect score. Yes, that’s right. Krumpe’s gets a 5/5. Did you know that Shortstop has donuts? Duc did. That’s a donut radar, if you ask me. Shortstop’s donuts are apparently made every day, although they clearly aren’t making the dough at Shortstop, so we wonder if it’s the same dough that Ithaca Bakery buys. The donuts appear somewhat similar, although Shortstop’s are a bit fresher — a bit more moist. Our first tastes are from the plain glazed yeast donut. It is pretty average. Not too much flavor, but what’s there is non-offensive. It’s somewhat moist, although still ultimately too dry for our *ahem* highly trained donut palettes. Laurel gives it a 3, and Duc gives it a 3.5. Pretty average. The frosting is of unknown flavor. We really don’t know. Citrus? It’s strange, it doesn’t make sense — the frosting melts, or… doesn’t melt… in a very strange way on our tongue. We are quite confused. The white-frosted donut gets a 2 from Duc, and a 1.5 from Laurel. We move to the chocolate-frosted version, which is better. The cake is dry, not very flavorful, and ho-hum. The chocolate frosting is sort of hot-chocolatey — not very good but not very bad either. Laurel gives it a 3, and Duc gives it a 2.5. Somehow the cinnamon sugar flavor ties in the flavor of the cake more, making the dry aspect slightly more tolerable. We both give this donut a 3. And of course, the worst for last, the dreaded chocolate-cake donut. To give it credit, although it tastes terrible, the texture is pretty nice. Oddly moister than the other cake donuts. But it does seem like no one can get this donut right. Seriously. 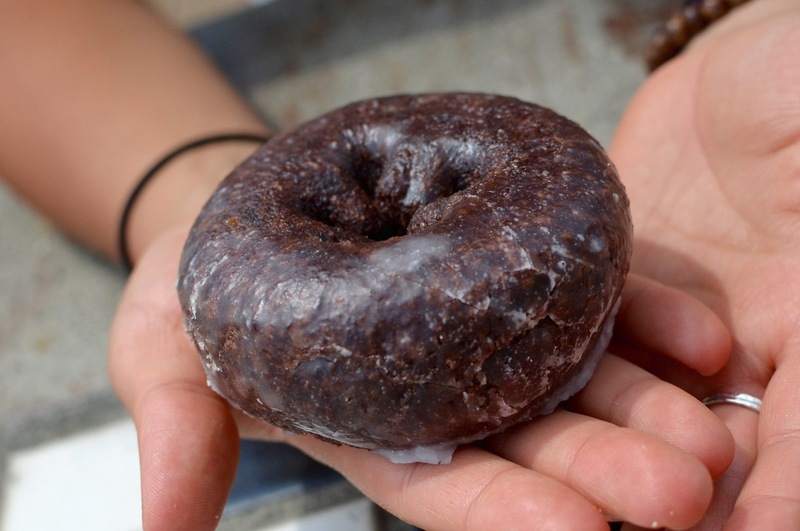 Have you ever had a delicious chocolate cake donut? Please, someone. We’re starting to think it doesn’t exist. Laurel is starting to think she’s going to have to make one herself, to see what the problem is. We both give it a 2. OK. So we were a little bored by these donuts. They were super average — they sort of sufficed, but they didn’t really satisfy our desire to indulge. 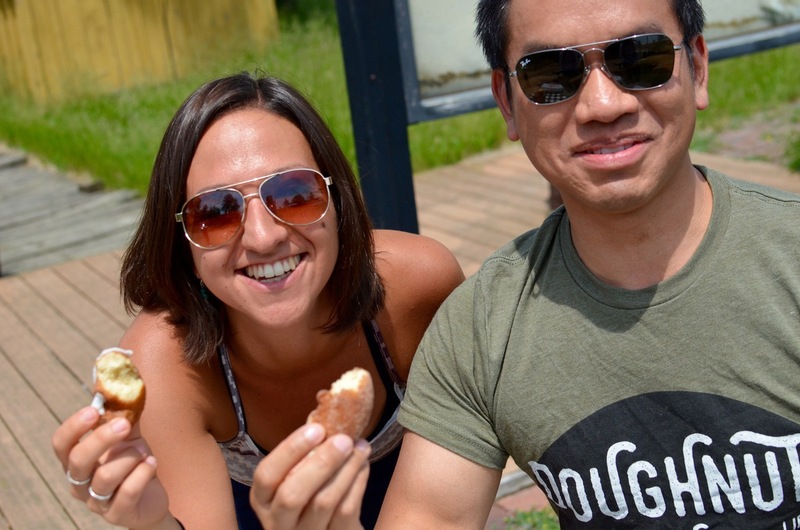 But we were happy to be back tasting donuts for the Ithaca Donut Review. All averaged out, Shortstop gets a 2.5/5. Our friend Kevin passed through at the end of our tasting and was somehow extremely pleased with these donuts. “What do you think?” we asked. “I think they’re great!” he said.